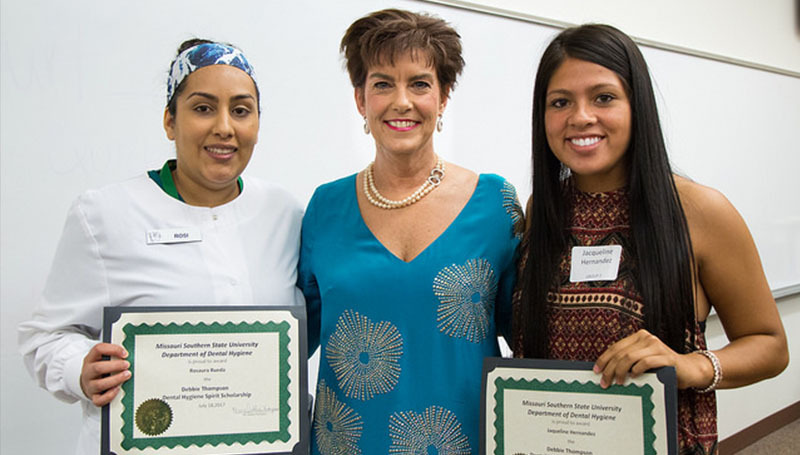 Two dental hygiene students were awarded the Debbie Thompson Spirit of Dental Hygiene Scholarship during the program’s orientation ceremony held Tuesday, July 18, at Missouri Southern State University. Jaqueline Hernandez, a junior from Webb City, Mo., and Rosaura Rueda, a senior from Rogers, Ark., were announced as the recipients of the $2,500 scholarship. The endowed scholarship was established three years ago by Thompson, who has worked as a dental hygienist for more than 30 years. Each year, the scholarship is awarded to a first-year student and a second-year student. The scholarship will continue into the student’s second year if they maintain their standing within the program. Thompson, who is a former faculty member at Missouri Southern, co-owned dental practices in Joplin and Cassville with her late husband, Dr. Patrick Thompson. During her career, she served as a dental hygienist with the American Red Cross in Japan and wrote columns on the subject for newspapers. To be considered for the scholarship, students must submit an essay, have a cumulative GPA of 3.0 or higher, have a record of community service and extracurricular involvement and demonstrate leadership abilities. “I really enjoy seeing the finalists that the committee sends to me,” said Thompson. “This year it was amazing. Both of the top girls had 4.0, both had a lot of community service and have given back to society. That’s what I’m looking for. This (scholarship) is not need-based. It’s given based on the person.